We ﻿saw Clarence Spady play a the Ephrata Main Theater this past November and left BEGGING the organizer to get him back again… and he’s delivered… this time with reinforcements! 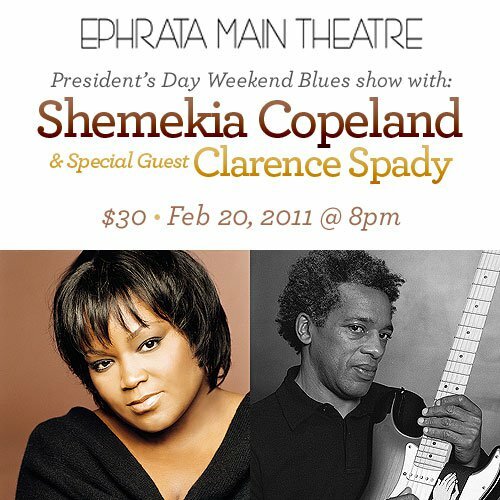 This concert, with Shemekia Copeland as headliner, is scheduled for Sunday of President’s Day Weekend and is certain to sell out. So, if you’re thinking about coming into town for the show… and believe me, it’s WORTH it… book your tickets now. The Smithton Inn is just a mile away from the venue, so it’s the perfect entertainment combination!